Calin, the Corolle Mon Premier 12 inch baby doll makes the perfect first baby doll for girls to have. She resembles a little baby more so than many other hard, plastic dolls on the market. For starters, Calin has a soft bean filled body which makes her all the more huggable and softer to hold and hug. Her arms and legs are still made from vinyl and she has a subtle vanilla scent on her that gives her a delicious smell, making kids and adults want to hold her and never let go! Made in France, Calin is beautifully styled and has baby blue eyes that open and close shut when she lies down. She is lightweight and around 12 inches tall. Little girls all love their baby dolls because it brings out their caring and nurturing side but with Calin, playing make believe mums with babies is easy, because Calin is so very cute and soft. She is easy to clean too and comes in a beautiful 1 piece pink and white woolen outfit with hat. 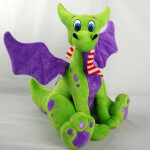 Calin is a nice 12 inch size, which makes her very easy for little girls to carry around easily. She is also very easy to put into her stroller and take for a walk too. Corolle dolls are beautifully made and most parents comment on how life-like these dolls appear to be. For many, and it was the same for us although we bought our daughter a Baby Annabell doll, it seems that the time that a baby doll came in most handy was when we had our second child. If your first-born is a girl, then it is easier to buy them a doll because they look so much like a baby. Our daughter used to look after her “baby” whilst I took care of the new arrival and in this way, there was no jealousy or sibling rivalry since my daughter was so pre-occupied with her own “child”. For many parents, buying a new baby doll for their girls when a new arrival is on the way is a great idea and if you can get a baby doll that really does look like a baby, as the Corolle doll Calin does, then all the better. Another beautiful doll by Corolle is the Special Feature Baby Doll Lila. Baby Stella is another cute doll for young children and she is available in different colored hair and is lovely and soft to hold making her an ideal doll for a baby.